How old should a girl have to be to legally marry with her parents' consent? Gallup posed this question to Americans in one of its earliest polls, in 1937. At the time, 53% thought "girls" should be 18 years old to legally marry with parental agreement. The rest had opposing views: 25% said girls should have to be 19 or older, while nearly as many, 22%, said they could be younger than 18. If a girl has her parents' consent to marry, how old should she be before the state permits the marriage? About half of men and women polled 80 years ago -- 53% each -- thought 18 was the right threshold age for a girl to legally marry. While men were divided over putting the number above or below 18, women were about twice as likely to say girls should be older than 18 as they were to say younger, 30% vs. 16%, respectively. Views on this varied little by age, but adults 55 and older were more likely than those under 55 to think a girl should have to be 19 or older to legally marry. Regional differences were more interesting, with residents in New England, as well as the East Central and Mid-Atlantic regions, tilted toward thinking "girls" should be 19 or older to marry, while those in the West Central and Pacific Coast states were closely split in thinking they should be older vs. younger than 18. Those in the South, Southwest and Rocky Mountain regions were the most likely to tilt toward allowing girls under 18 to marry. Referring to women of marital age as "girls" is, of course, passé today, but there are two other things that reveal this question's age: it carries an assumption that a female must have her parents' consent to marry, and it was asked only about girls, not boys. What hasn't changed is that children still get married in the U.S. Although most states now set 18 as the minimum age a girl can freely marry without her parents' blessing, every state allows exceptions in certain cases, such as with parental consent or when she is pregnant. According to one study of state marriage license data from 2000 through 2010, "in 38 states, more than 167,000 children -- almost all of them girls, some as young [as] 12 -- were married during that period, mostly to men 18 or older." Read about Americans' current views on marriage here. 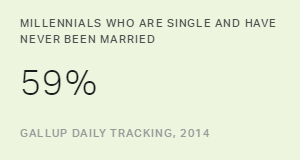 According to a Gallup analysis, millennials in the U.S. are delaying marriage longer than any other generation before them, though they do intend to marry and eventually have children. Along with the sharp decline in marriages among young Americans, the percentage living together has hardly budged, meaning not only are fewer young adults married, but also fewer are in committed relationships. Despite a record-high number of women elected to the 116th Congress, half of U.S. women are dissatisfied with their treatment in society.